Manicuring one's nails has always been in fashion. It makes a statement about the life and times of a person and often their emotional base. Each year makes way for a new set of colors, lengths, shapes, hardeners, designs, polishes that dry fast, and more. From bitten nails, to clipped nails, to acrylic nails and the like - when you really take look at your nails you will gain insights into who you are and how you see yourself. 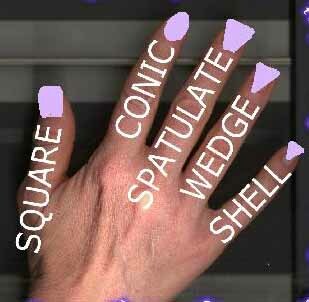 Look down at your nails and analyze your personality based on what you see. A nail is a horn-like envelope covering the dorsal aspect of the terminal phalanges of fingers and toes in humans, most non-human primates, and a few other mammals. Nails are similar to claws in other animals. Fingernails and toenails are made of a tough protein called keratin, as are animals' hooves and horns. The mammalian nail, claw, and hoof are all examples of unguis. Healthcare and pre-hospital-care providers (EMTs or paramedics) often use the fingernail beds as a cursory indicator of distal tissue perfusion of individuals that may be dehydrated or in shock. However, this test is not considered reliable in adults. This is known as the CRT or blanch test. The fingernail bed is briefly depressed to turn the nailbed white. When the pressure is released the normal pink color should be restored within a second or two. Delayed return to pink color can be an indicator of certain shock states such as hypovolemia. Nail growth record can show the history of recent health and physiological imbalances, and has been used as a diagnostic tool since ancient times. Deep transverse grooves known as Beau's lines may form across the nails (not along the nail from cuticle to tip) and are usually a natural consequence of aging, though they may result from disease. Nails are a window to the entire body. White spots on your nails don't indicate a calcium deficiency. Men's nails grow faster than women's nails. Nails are what separate the primates from the mammals. 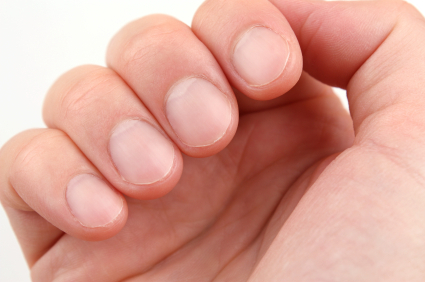 About 10 percent of dermatological conditions are nail-related. Stress can take a toll on your nails. There's a reason we can't stand nails on a chalkboard having to do with the ear canal. The hardness of your nails is mostly genetic. Your nails need blood to survive. 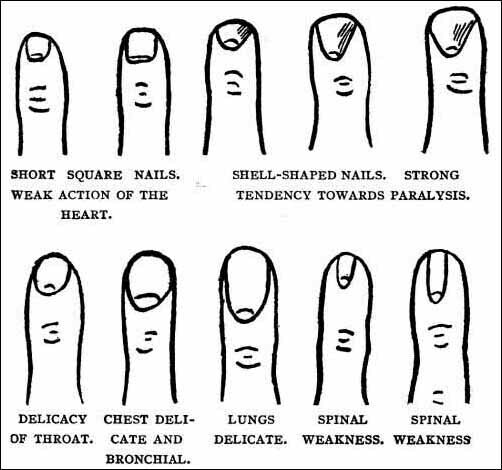 Nails also play a role in Palmistry . The size and shape of the nails reflect things about one's personality and health.